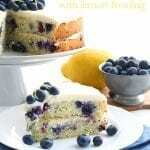 Low carb lemon blueberry cake: the best low carb cake of the summer! Zucchini, blueberries and lemon come together in a heavenly gluten-free, grain-free dessert. Keto and THM friendly. 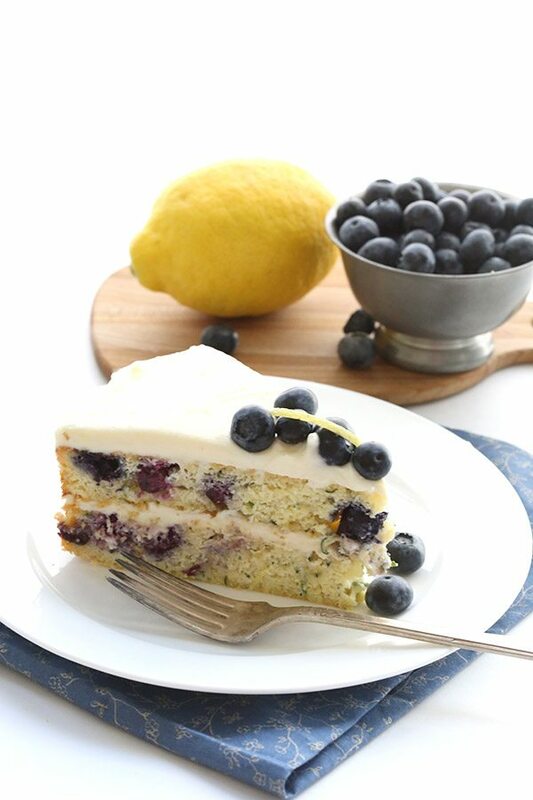 This amazing low carb lemon blueberry cake recipe was inspired by a wonderful blogger friend. The internet is a funny thing and the friendships you make online can be a little deceiving. Some people are not at all like you think they will be when you meet them. 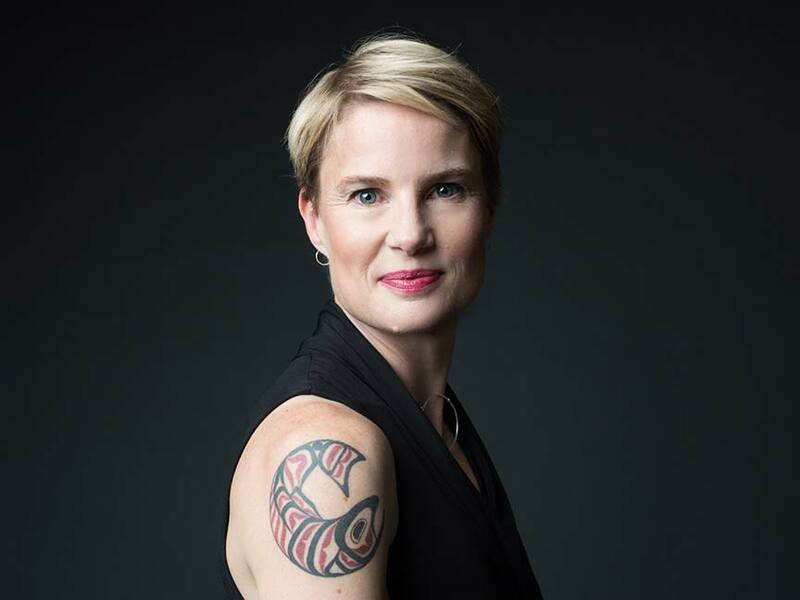 They hone an internet persona that is entirely different from who they are in real life, and if and when you do meet in person, it can throw you for a loop. It’s not that they mean to deceive you, really. It’s just the nature of life online where you aren’t limited by the usual trappings of accepted social protocol. You can dispense with small talk and get to the nitty gritty a little more easily. So what I often find is that people who seem very gregarious and friendly online are much more reserved, sometimes even painfully shy, in person. And this always comes as a surprise to me. However, I recently chanced to meet a fellow blogger and online friend in person who was exactly the reverse of that scenario. Amanda of I Am Baker and I have been chatting online for several years in many blogging groups and such. And we have exchanged messages behind the scenes as well. She would ask my advice here and there and she always referred to herself as shy and unpopular. So you can imagine I had an image of her in my mind as I went off to a conference that we were both attending. I thought she’d have a quiet smile and a gentle manner and that I’d have to work to draw her into conversation. Well imagine my surprise when she turned out to be one of the most outgoing and energetic people I’ve ever met. She was quite literally the life of the party, cracking jokes and laughing in a glorious, booming laugh that made everyone around her want to join in the hilarity. The rest of us were like moths to the flame, all drawn to her presence every time she walked in the room. And yet she was humble and friendly to everyone, despite her immense popularity. I was floored, completely and utterly floored. Yes, friends, I was entirely duped by Amanda. And I like her all the better for it. She also happens to be one of the most talented cake bakers and decorators out there. 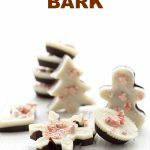 While none of her creations are low carb or gluten-free, they are a wonderful source of inspiration. I had bookmarked her Blueberry Zucchini Cake with Lemon Buttercream ages ago as potential recipe for a low carb makeover. And then a reader emailed me with the link, suggesting I make it over. And THEN I ended up with a super-productive zucchini plant in my garden that gives me 1 or 2 large zukes every few days. It also happens to be blueberry season here in the Pacific Northwest. With all of those stars aligned, how could I not make this? 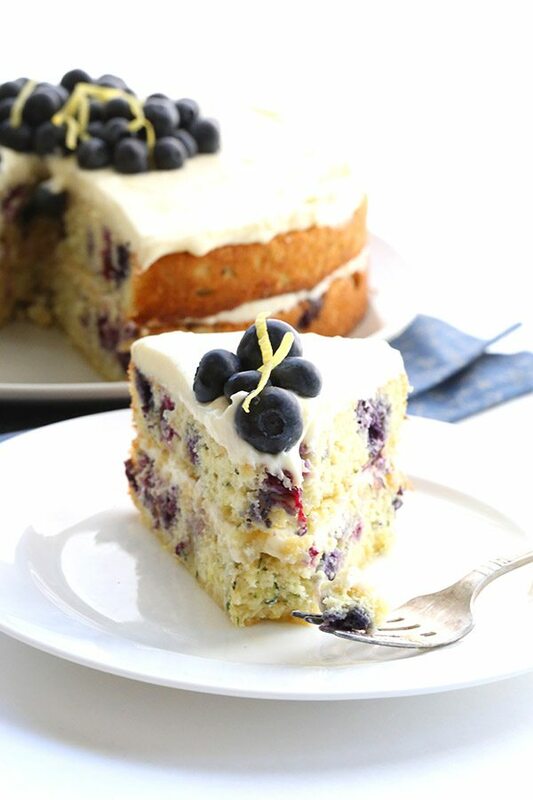 The best low carb lemon blueberry cake. Zucchini, blueberries and lemon come together in a heavenly delicious sugar-free layer cake. Place zucchini in a sieve and sprinkle with salt. Toss to combine. Let drain 1 hour and then press on zucchini to release as much moisture as possible. Preheat oven to 325F and grease 2 (two) 9-inch round cake pans very well. You can use 8 inch pans as well but your cake will need to bake a little longer. And if your pans are not very non-stick, you may want to line them with parchment paper and grease the parchment. In a medium bowl, combine the almond flour, whey protein, baking powder and salt. In a large bowl, beat butter with sweetener(s) until well combined. Beat in eggs, lemon zest, zucchini and vanilla extract. Beat in almond flour mixture until well combined. (If your batter is quite dry, add 1/4 cup to 1/2 cup unsweetened almond milk until it is a thick but spreadable batter). Gently fold in blueberries. Divide batter between prepared pans and spread evenly to the edges. Bake 35 to 45 minutes, until golden brown around the edges and set on the top. Remove and let cool 10 minutes in pan, then transfer to a wire rack to cool completely. In a large bowl, beat cream cheese and butter together until smooth. Beat in sweetener until well combined, then beat in lemon zest. Beat in 3 tbsp lemon juice. Add remaining tbsp if frosting is too thick. Place first cake layer on a serving platter and spread the top with half of the frosting. Add second cake layer and spread with remaining frosting. Top with fresh blueberries. Serves 16. Each serving has 9.73 g of carbs and 3.11 g of fiber. Total NET CARBS = 6.62 g.
What do you do with the zuchinni once it’s drained? Mix with the dry ingredients or add into the egg mixture? Sorry, all fixed. I had “vanilla” listed twice in the instructions and I meant zucchini for one of them. yOu need a dry protein to replace the gluten, otherwise your cake will not rise as well. Can I use egg white protein powder I can not have whey. No. They tend to make things gummy. You can try egg white protein though. Oh, wow!!! I wish today were my birthday!! Lemon frosting AND blueberries=brilliant. This looks delicious!! Do you think it would work if I baked this as a loaf? Sounds and looks delicious Carolyn, and I have all these ingredients ready to go! Thanks for the recipe. WOW…another great recipe to use the blueberries from my bushes…thanks again, Carolyn! You have listed Swerve Sweetener and then Swerve – 1/2 cup each – isn’t this the same thing? Why not list Swerve once as 1 cup? Read the recipe a little more closely…I list an option for 1/2 tsp liquid stevia, which I used, OR another 1/2 cup Swerve. So it’s what YOU prefer. Duh – see that now! Thank you! Has anyone tried different sweeteners other than swerve? I have xylitol, trivia and stevia on hand! Any of those will work in the cake but you need a powdered sweetener for the frosting. 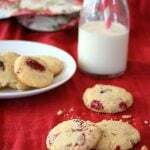 Hi Carolyn, can you make this with coconut flour instead of almond flour? I don’t happen to like almond flour or almond meal…thank you! Wendell did you try it with coconut flour? I like to save my coconut flour for keto bread. 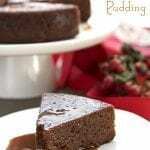 Ilove your recipes! My question is can I substitute vanilla protein powder for unflavored? Yes, but it will give a distinctive vanilla flavour so leave out any additional vanilla. About how many zucchini for 3 cups shredded? Pinned! I can’t wait to try this cake!! I’m definitely making this cake! Thanks so much! Yum! Now THAT looks like one yummy cake!!! I’ve never tried baking with or using whey powder – does it help to bind it all together? Can I substitute with something else? Will definitely try this – thanks! It helps baked goods rise and hold their shape in the absence of gluten (another dry protein). But you can use powdered egg whites instead. I would bake the first layer and then remove it after it cools for a bit, and then I would bake the second layer. I love both lemon and blueberry! I have a recipe for brownies with zucchini that I love so I can’t wait to try these! I’ve never used whey protein; exactly what purpose does it serve in this recipe? Can it be omitted or substituted? (I think I’ve only seen it come in ginormous containers? I’m not sure I’d ever use it again…). 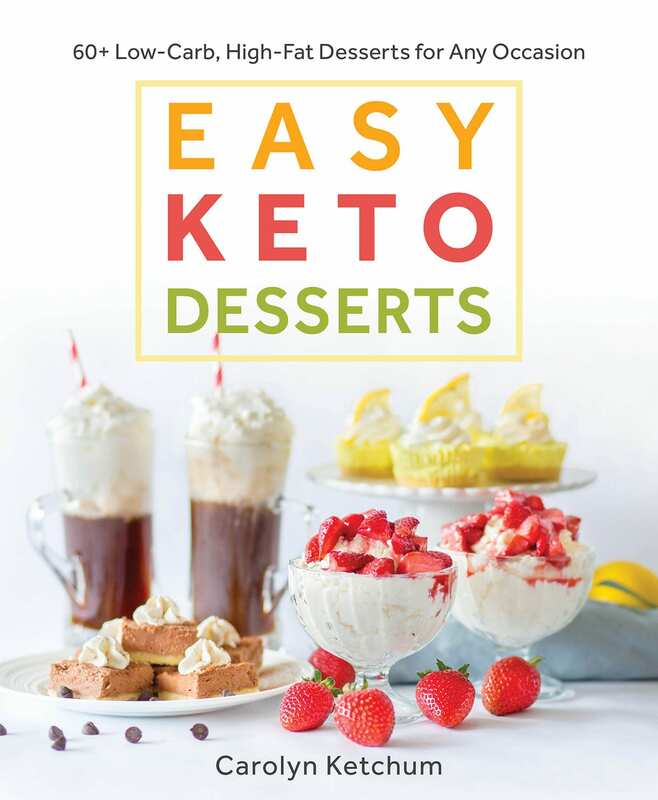 Great job on recipes – I’m trying to omit carbs in my life and having a hard time sticking to it without a variety of some tasty treats and flavorful recipes – can’t wait to try some of these! For some reason the comments didn’t load before I asked the question – so I see my answer! Gluten is a protein and in its absence a dry protein like egg white powder or whey protein helps the baked goods rise and hold their shape. And you can get smaller containers and bags of it! The zucchini gives it a wonderful texture. I did notice that the recipe has no starch and a person just has to have starch when cooking with coconut flour and almond flour. Which is a problem if going low carb. So,— I see; you are telling me that the whey powder does the same thing. That is very good information, that I needed. I seem to be allergic to just more than gluten. 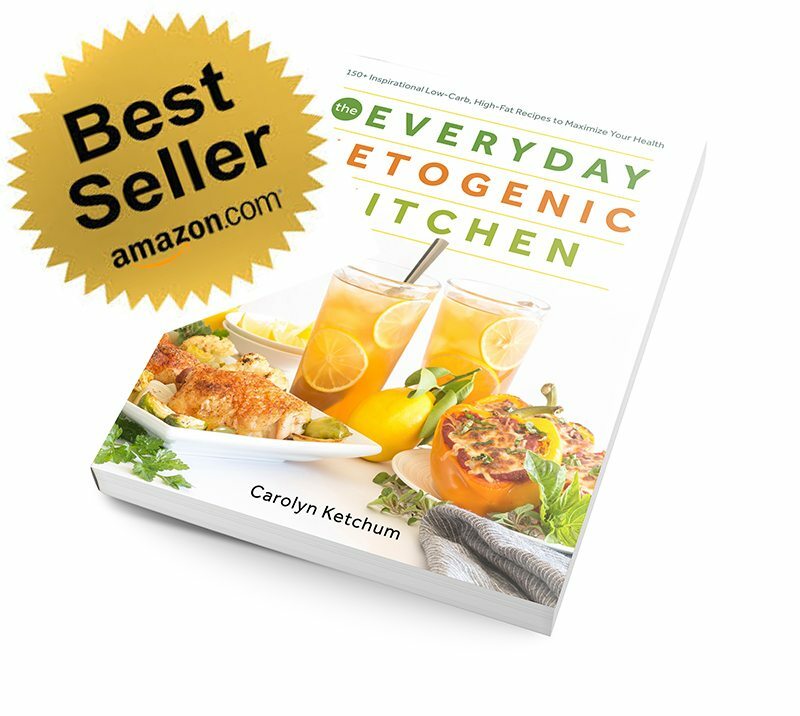 I was doing great on a low carb diet and when I added more into my diet – well gluten for sure; and that is all I can figure. I do hate psoriasis in my ears, even worse than in the joints of my toes and fingers. How many cupcakes did you make? And, how long did you bake them, and what temp? I baked mine for about 32 minutes at 325. I moved the pans to the lowest rack in the oven during the last third of the baking time, since they were already quite brown around the tops/edges. A full recipe makes about 16 cupcakes. Cupcakes, what a Great idea! Hi! Did you use paper cupcake liners? I’m concerned about them sticking too much. Thanks! 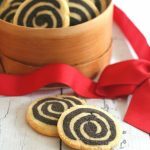 I’ve made so many of your recipes and I’ve never been disappointed! This one, however, absolutely knocked it out of the park! My hubby ate 2 huge pieces and I’ve never seen him do that. I normally stick to chocolate desserts but this is now one of my favorites. Thank you! Yay, I am so glad! 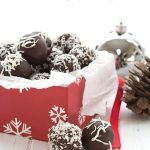 I have been doing Trim Healthy Mama for a few months and have been so disappointed with any of the desserts I have tried. But I made this on Friday, and , wow, it is so VERY delicious! 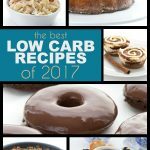 I will be definitely be trying your other low carb recipes soon. Thank you! So glad it worked out and you loved it! Sounds good. I don’t have Swerve, okay to substitute either Truvia or Splenda? Truvia would be fine in the cake part but you really need a powdered sweetener for the frosting. Plus Truvia is sweeter than Swerve and doesn’t measure like sugar so I am uncertain of the amounts. This looks sooooo good Carolyn – I wish I had a slice right now. And, I have definitely had that experience of meeting someone in person and thinking they got switched with their online personality! You have salt listed twice in the recipe. I’m sure it’s an error, yes? No, that’s not an error. You salt the zucchini before you drain it and you also add a touch more salt to the batter. Should the zucchini be rinsed before draining? This cake is beautiful and absolutely delicious! We just finished eating our sample slices. Hubs, who has no need to watch his carbs and doesn’t like zucchini, gobbled his right up. This will be a special occasion cake in the future. Yum! This is a delicious recipe. I have made it twice now. The cake is light and delicious. Just a couple of thoughts. First, for my family this icing is way too sweet. I’m wondering if 1-1/4 cup of serve is accurate. I have found that Swerve is so sweet, I can usually cut it by half. For my second time making this, we actually used half the amount of sweetener for the icing, and a little less than 1 cup for the cake. It was perfect, for my family, this way. Second, for my second try at this, I wanted to use Xylitol and Swerve because I noticed the cooling effect the first time I made this recipe. This is just a preference. To add the Xylitol to icing, I melted the butter and dissolved it, otherwise the Xylitol would have had a grainy texture in the icing. It turned out perfect this way. Finally, I used “lemon extract” in this recipe and that also worked well. 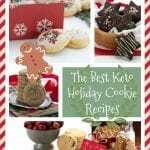 Your recipes are always delicious and I thank you for sharing them with me and my family. Thanks for your thoughts, Lorri. Everyone differs in terms of taste and sweet tooth(s). Many readers find my recipes not sweet enough so I always try to find a middle ground. 🙂 But you may be a super taster of things like erythritol so use what works best for you. Yummmy! is what I have to say. I made this scrumptious cake yesterday and it is delicious. I was worried that it was going to be dry because of how it looked coming out of the oven and I wasn’t sure if you measured the zucchini before or after squeezing it out. My worrying was in vain, we loved it and it is super moist. I went lighter on the sweetener because I’ve gotten used to things not too sweet, next time I will use even less. This looks absolutely fabulous and I can’t wait to try it! I don’t have any Swerve. Can I substitute THM Sweet Blend? If so, how much? I can hardly wait to try this recipe! I love lemon and blueberry together! I’ve got this cake in the oven now and it smells incredible! I used coconut flour instead if almond flour and I had to add quite a bit of unsweetened almond milk for it to even be spreadable. It seems really dense. I really hope it turns out okay! I can’t wait to try it! Made this tonight and it is out of this world fantastic! What a perfect delicious cake! This is so very flavorful, light and airy and a perfect combination. My husband and I both agree its one of our favorites! Thank you so very much! Could I replace the whey protein powder with a TBS of homemade baking soda? I am doubtful that would replace the whey properly but you are certainly welcome to try. I made it in a Bundt pan– baked it longer and felt for how jiggly it felt. 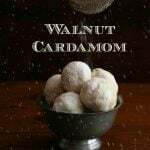 I waited until it felt very set up, but might have needed yet more time as it was definitely soft in the middle (I have a picture if you want to email me)– you’d want to cover it near the end to keep it from burning as almond flour can so easily do. Also, you’ll have extra frosting because of not having the middle round layer… or you’ll need to layer it on thicker. I brought the cake to a family gathering un frosted as I had run out of time. While frosting it my father-in-law (type 2 diabetic) couldn’t keep his fingers out of the extra frosting. He was so excited when I told him it was sugar free. It’s excellent on its own and it stays good in the fridge for forever. I have to tell you a good story—well two stories. The reason I made it in the Bundt pan is my round pounds were in use to make this for a friend’s birthday (her favorite) and it looked so good I made one for me in the Bundt pan. Wow…. we all loved, loved, loved it. So moist and flavorful. I didn’t have the whey so I used egg protein powder as seen in the comments and it was awesome. Even my husband who WILL NOT east zucchini under any circumstances liked it. My friend has been bragging and showing the pictures to everyone and swears her friends who don’t eat low carb would never know. In fact, her daughter who is usually THE designated/gifted baker in the family was offended I took her place in baking this (her dad commissioned me to make it since she just had baby #3 and is a little busy!). She liked it so much it was part of what made her decide to do keto! She’s going strong now several weeks with great success. Related—A few months ago that same daughter baked a non-keto, full sugar lemon blueberry cake for a family gathering before her mom (my birthday-friend) was “out of the closet” about being low carb. My friend ate some because she didn’t want to offend her daughter and because she loves lemon blueberry cake so very much. On the way home, the impact of the sugar was so strong her husband was about to pull the car over to see what was wrong… did she need to eat? Did she need a pain pill? What? The hit of white sugar and flour turned her into a NOT-very-nice-AT-ALL-person and she had a terrible sugar crash after that and her MS pain came raging back the next day. It was the last time she’s had sugar and it’s a story she tells everyone that made her the die hard low carb girl she is today. All because of lemon blueberry cake which is now redeemed! So glad it was a hit with everyone. and your poor friend! Glad she found low carb really helps. Thanks… Do you have any bundt cakes other than the Buckeye? 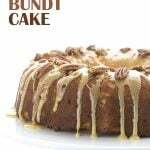 If you want something else, just type “bundt” into the search box here on my blog and you will find quite an array of bundt cakes. I have enjoyed several of your desserts! 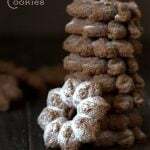 I follow the THM plan and I am just wondering if you have an opinion on how much THM baking blend or a very similiar blend could replace the almond flour?? It would help cost and calorie density! Was hoping someone had already asked that question, but didn’t see it! It’s tricky, because the baking blend is much drier than almond flour so you risk a dry, crumbly cake. I think you’d maybe want a little less of it. (2 1/2 cups?) but to add another egg to help bind it and give it extra moisture. Does this taste like zucchini? I like zucchini, but maybe not a cake that tastes like it. No, zucchini simply adds moisture to a cake like this. Do you use green zucchini or yellow squash? Such a great recipe! Quick question – I see swerve listed twice in the cake ingredients. Is it asking for 1/2 cup or 1 cup? Also, I don’t have liquid stevia. Can I leave out? Ignore my previous comment! I’m reading on my mobile and it didn’t show me the 1tsp of stevia or another 1/2 cup or swerve right. Thanks! I tried this recipe today and holy cow, is it ever delicious!!! Oh, also I did this in 6 inch rounds…5 layers. I baked them for a shorter time as a result. Tall and skinny and cute!!! I put blueberries and purple flowers on top! Hi! Do you rinse the zucchini shreds to get all of the salt off before using in recipe? No, you just add less salt in the rest of the cake. Carolyn I’m making this tomorrow! It looks fantastic. Do you peel the zucchini before shredding? No, leave all that good healthy skin on there! Do you suggest refrigerating this cake? Sorry if I missed that question being asked already. Tried to read all through the comments! I need to make it tonight to serve tomorrow. Yes, you should refrigerate any cake with a creamy frosting like this. It could. Flash freeze it first before trying to wrap it up, or your frosting will get all smushed. Hi – the recipe yield at the top says 1-9″ cake. I believe it should say 2-9″ cakes? anyone ever tried in a 13×9 pan? I believe some folks have, yes. Thanks for the recipe. I used coconut oil for butter, then instead of swerve 1/2 tsp powdered stevia, and a few drops of lemon EO, and egg white protein powder. Then the frosting was coconut cream, stevia, coconut oil, and a little agar agar. It still turned out really tasty and moist. Amazing! Thanks for sharing your substitutes was looking to make this for a dinner party that had dairy and nut allergic guests. Much appreciated! Do you have any suggestions for making this with coconut flour + more eggs instead of almond flour? I usually get headaches when I eat too much almond flour. Thanks! Most excellent suggestion! Thank you so much, Carolyn! HI! Would it work if I subbed THM baking blend for the almond flour? Thanks, can’t wait to try this. Love your recipes! Baking blend tends to be much drier so you may find you need a little more butter or another egg. 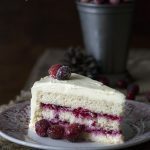 OH MY GOODNESS… I made this cake and it was moist, and so delicious.. AND, it did virtually nothing to my blood sugars.. 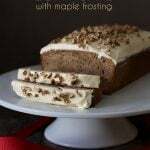 I used vanilla protein powder and added a bit of lemon extract to both the cake and the frosting. .I will be making this cake all the time.. Thank you for all your hard work and recipes. I cant wait to receive your new book. Do you think I could make this in a loaf pan? …or would the middle not ever get done before the outside turned into leather, lol? I think it may get brown on the outside but it should end up okay. Cover with foil while baking to keep it from being too brown. Hi! This looks great–two questions–is the zucchini measured before or after draining, and should it be packed? Thanks! Measure before draining and don’t pack. Do you have a suggestion for a dairy free frosting for this cake? thanks! The only decent low carb dairy-free cream cheese I have ever tried is Kite Hill. I found it at Whole Foods. Not to ask the same question again, but I dont use protein pwders..should I add more almond flour or some coconut flour instead and then another egg or more butter as suggested previously? This was sooooooo good Carolyn!!! Thank YOU so much and as always I am loving every bite! Was hoping my husband would not like it so there would be more for me…but he loved it too! I really enjoy reading your recipes but can not bring myself to use all the artificial sweeteners and so much of it. Have you tried using date purée or coconut butter or even prune purée? HI Scott, I don’t use any artificial sweeteners. Erythritol is a naturally occurring substance, as is stevia and monk fruit. So no worries there! However date or prune puree is not a possibility for me, with diabetes. And to be frank, it’s essentially sugar in another form. This is my new favorite ands I’m out of almond flour!!! Any chance I can use coconut flour if I don’t drain the zucchini as well?!? Thanks in advance! 1. If I use a 9X13 pan, how should I adjust cooking time/temp? 2. If I use a “Gluten Free Flax & Ancient Grains All-Purpose Flour,” (brown rice, flaxseed, quinoa, buckwheat, and amaranth) should I use the same amount as the almond flour? Would I still need to add a protein powder. I am sorry, I cannot guide you using the flour you suggest as I don’t use anything like that. 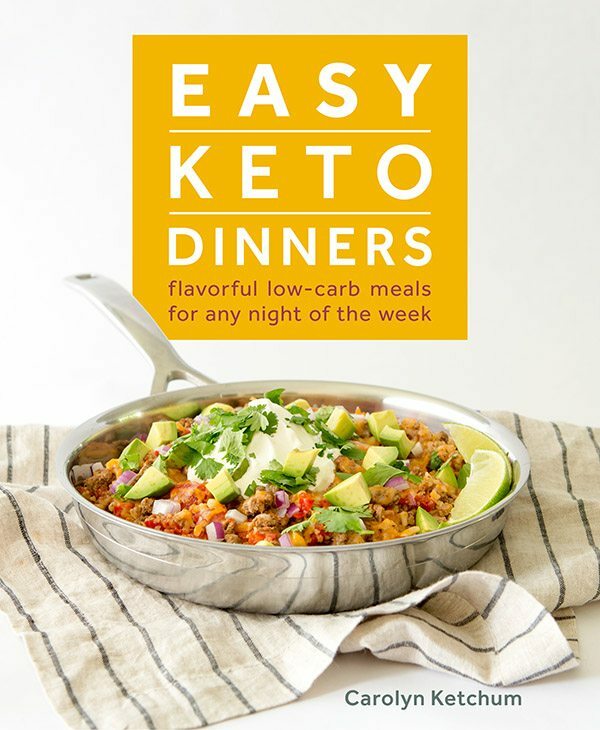 This is one of my favorite low carb recipes. I’ve made both this and the regular version together for a pot luck and had more people like the low carb version! I can hardly wait until next zucchini season. Always a great flavor combo!! Lemon and blueberry is one of my favorite combinations! The frosting on this cake is irresistible! 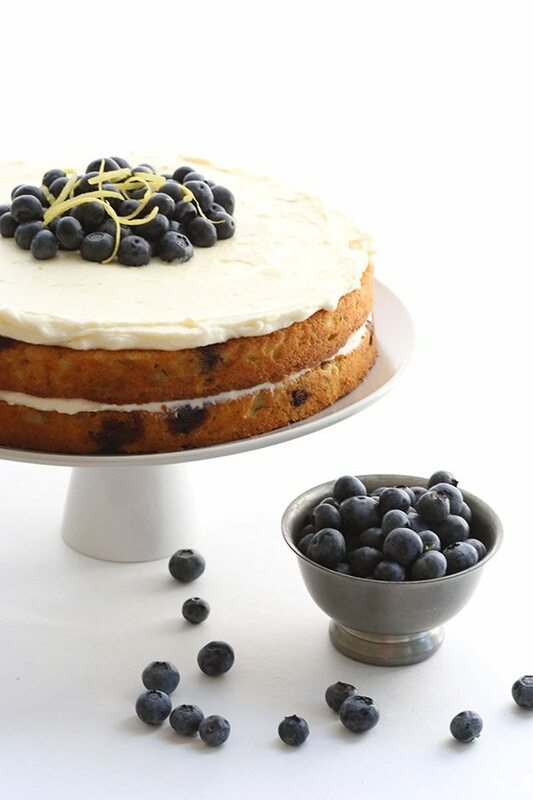 I love the combination of blueberry and lemon in a zucchini cake. This is so tasty and beautiful, too! What a perfect light treat! Blueberry is a favorite of mine! I know zucchini is in the name and I’ve made this superbly delicious cake before but no zucchini in the house and the wrath of winter is upon us in mid-April Can I make this without zucchini and get the moisture from elsewhere? Really craving the blueberry and lemon goodness today. I am sure you can. Just add more liquid util the batter feels about right. Winner! Passed the taste test with two picky people that are hard to please in my household. Great without the frosting. I had frozen zucchini slices in my freezer that were harvested last summer. I blended it with the wet ingredients. It was pre-measured at 4 cups prior to freezing, but the freezing “shrinks it”. Wonderful cake! I made this today for a mother/daughter banquet at church. Instead of almond flour, I used 2 1/2 cups of baking blend and an extra egg. Also added some unsweetened almond milk. Baked in a 9 x 13 pan. Everyone who tried it loved it. Thank you for this recipe. It’s a keeper! I made cupcakes with recipe. Here is too hot, should I keep them in the fridge? Made this for my daughter’s birthday. WOW. So good! This was a huge hit at my house! Such an amazing cake!! YUM!! I would LOVE a slice of this right now! It sounds amazing! My favorite flavor combo! This cake is so moist and delicious. This is my kind of cake! Love any kind with lemon and blueberries. Talk about an amazing dessert! Love the lemon and blueberry together. 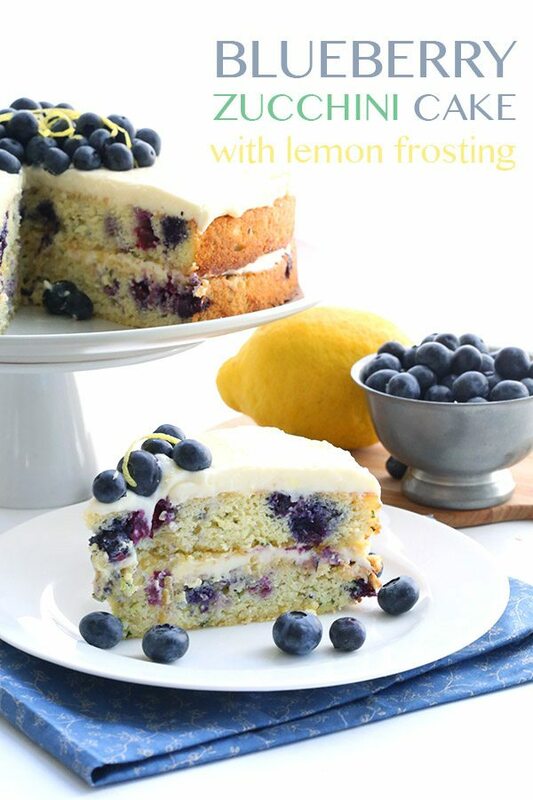 Lemon and blueberry is one of my favorite flavor combinations, especially for spring. This cake looks spectacular! 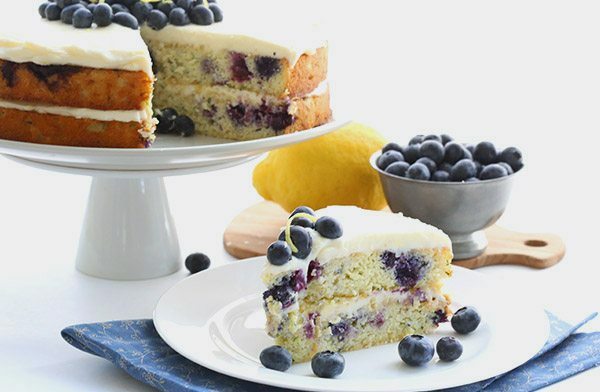 I love the blueberry and lemon combo in this cake…so delicious! I have missed blueberry cake on my diet – you’re a lifesaver! This looks AMAZING! Can’t believe it’s low carb! This is one my favorite recipes. I’ve made it enough times that today I made them just glancing at the recipe. I make them in cupcake form(although I think they are more muffinish), and half way through cooking I realized I forgot to fold in the blueberries! Say it is t so! Maybe I’ll thaw some blueberries, and melt some butter, and mix them into a spread. Who knows. These really are the bomb! I eat them without frosting…. too sweet for me, but I do add extra lemon! Thank you! So moist and deliscious!